Babis suggested that the ideal place for a store would be the Ministry of Regional Development building in the city's Old Town Square. The meeting was documented by Babis on Facebook, and by local news site Letemsvetemapplem.eu. The pair also discussed topics such as artificial intelligence and the economy. Cook noted that there are about 500 researchers in the republic working on AI. 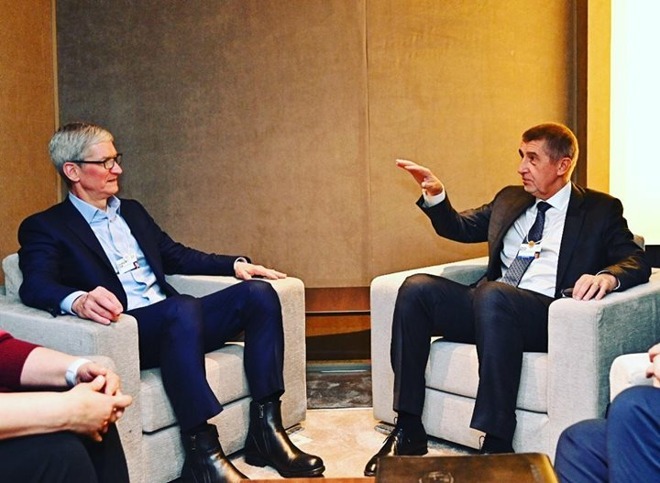 Apple doesn't have any retail footprint in the country despite the prominence of Prague and the popularity of the country as a tourist destination. Although it was repeatedly bombed by the U.S. in 1945, Prague suffered comparatively little damage in World War II next to other European capitals, leaving much of its historic architecture intact. The annual World Economic Forum gathering in Davos, Switzerland, offers corporate and political leaders a chance to talk with each other about future plans. Cook has already met people like Dubai's crown prince, the chancellor of Austria, and Armenian Prime Minister Nikol Pashinyan. A point of controversy was a group dinner including Brazilian President Jair Bolsonaro, a far-right politician who has defended torture and the murderous military dictatorships of Brazil and Chile. He has also vocally attacked homosexuality, which could be a problem for Cook.